Whenever I stop and take a step back I sometimes get the feeling that we are like dogs chasing our own tails. We use so much energy and make so much effort, but to what purpose? From homo sapiens to homo omnistressens, from human being to human doing, ever rushing, never satisfied, even to the point where we seem prepared to sacrifice the very world we live in and are dependent upon. Many years ago it struck me that we often perceive our existence as if it consisted of two basic parts – ‘me’ and ‘my life’. 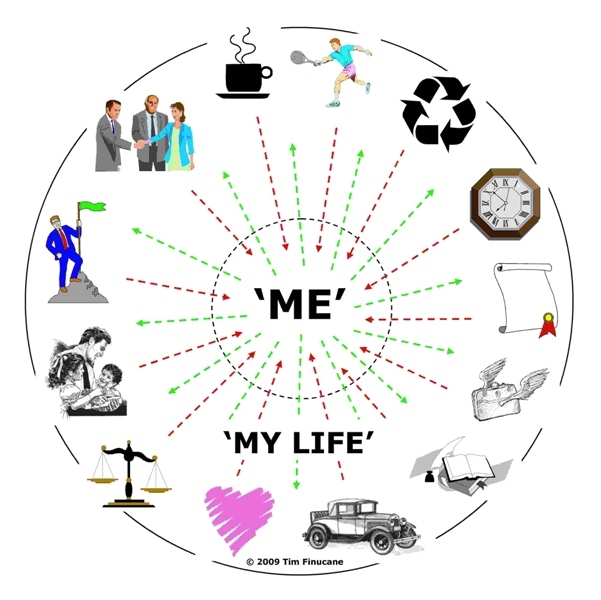 ‘My life’ consists of all the things around me that ‘I’ work and struggle to attain, put into order and maintain – money, relationships, education, a home, at least one car, a load of TVs, a job, pension, holidays, etc. A lot of effort goes into managing this huge portfolio of ‘things’, people and events, all so that I will hopefully in the end feel satisfied and happy inside. The more I have, the more I need and the more I become involved in this endless management – and endless struggle – to create and maintain order on the outside so that I can experience order (calm and peace) on the inside. I call this ‘working from the outside in’ (the red lines in the diagram below). The problem with this approach is that it is very one-sided. It is limited, limiting and potentially destructive (just look at the way we treat our resources). Even if I succeed in getting everything into place, something always starts to move. Or someone else moves it! The lovely car I just bought gets stolen. The money I invested and that was growing so beautifully dwindles to nothing when the market crashes. The skills I had that were so valuable – become defunct and worthless. The love I found in my partner changes to indifference or hatred. Any part of the picture can change at any moment, threatening to disrupt the peace and harmony inside me that I worked so hard to build up and protect. Perhaps this is why I get so possessive and am prepared to fight to the death to defend anything that is ‘mine’ – because by losing the order ‘out there’ I risk losing the order ‘in here’. Clearly there is a limit to how much I can control things and events out there. And yet it seems in my reflection that I still persist in trying to be in control of events, even those beyond my reach. What a waste of energy! Since ‘order’ inside ourselves – manifested as inner calm, contentment, happiness or whatever you want to call it – seems ultimately to be high on our agendas (really, for what other reason would we work so hard? ), perhaps there are other ways to help achieve this. Perhaps it is possible to work on this inner order directly – from the inside – instead of making it reliant upon the way external events turn out (the green lines in the diagram). One part of this ‘creation of inner order’ would be to straighten out our posture and the way we use the body. Just understanding something as simple as elevation can help create a better order inside the body (which lengthens and opens up the body, lightening it and allowing for better breathing and a stronger presence). Just think about how oppressed postures and movement contribute to our daily struggle. Nothing on the outside can make this go away. Calming the mind, dispersing the cloud of thoughts within which most of us live with is another part of this work. Just sitting down and making the effort to be still and silent for twenty minutes every morning and evening adds considerably to creating the inner order we seek, and that rushing around chasing our tails will never achieve. Making inner effort to create and strengthen our inner order does not replace the effort we make to create order around us in our homes and at work. Of course, this has to continue. But the difference is this: when we work from the inside outwards, this changes our relationship to the world around us. Instead of becoming dependent upon things and events, it becomes easier to relax and be a little more detached. It is easier not to get caught up in all the BS and hype that is thrown at us. It is easier to maintain one’s sanity and one’s dignity in a world that appears slowly to be going mad. It is easier to just be, whatever happens. Christmas is coming and the goose is getting fat. Thanksgiving and Lucia are also just around the corner. Let’s stop a moment and do ourselves a favour – get into balance and calm our spirit, at least for five minutes. After all, a world in balance and harmony cannot possibly be achieved without people who first strive to achieve balance and harmony inside themselves. The Accidental Ergonomist is powered by WordPress.